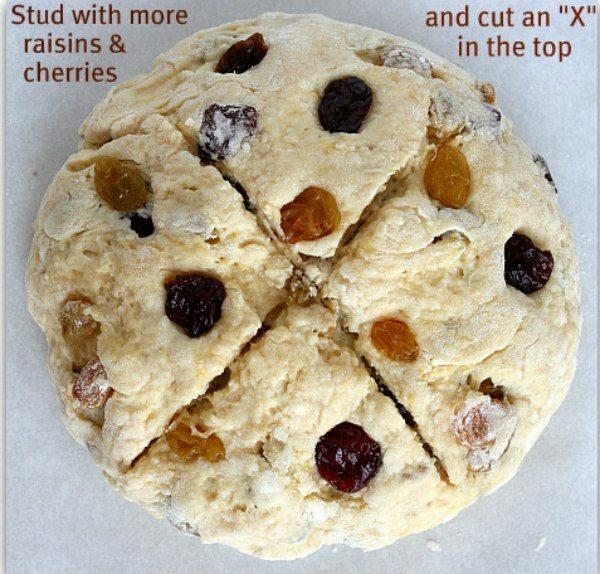 This Breakfast Irish Soda Bread recipe has plenty of dried cherries and golden raisins mixed in. 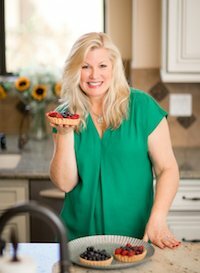 My husband’s family is 100% Irish so I went searching for the perfect Irish Soda Bread recipe to try this year. He doesn’t really come from a family of cooks, so this proved to be a daunting task. My Mother-in-Law makes hers with a base of Bisquick. That’s not quite my thing. Second cousins came directly from Ireland so I figured I had it made with that part of the family. But sadly, no one had a recipe… not even one. Isn’t that just crazy? 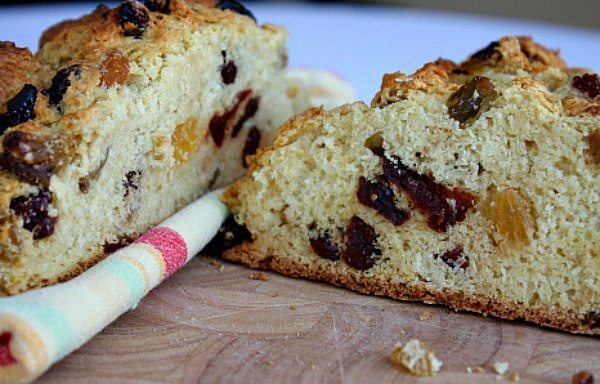 An Irish family without an authentic Irish Soda Bread family recipe. Bummer. Lesson learned here: write down your family recipes and make sure your kids get their hands on them. They’re treasures to be remembered and passed along! 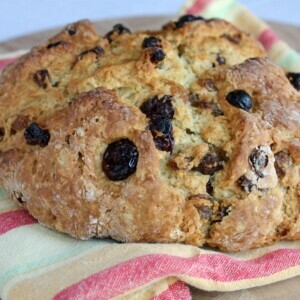 Lucky me, I’ve had this Breakfast Irish Soda Bread recipe sitting in my collection of recipes for a long time. The recipe begins in a food processor. 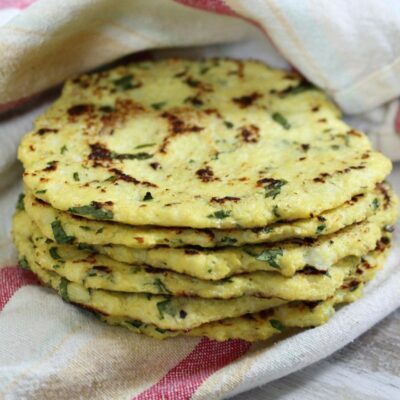 Dry ingredients whirred together with butter and then dumped into a bowl to mix with buttermilk, eggs and the dried fruit. The dough is then dumped onto a floured surface, kneaded a bit and then divided in two. The two halves are then shaped into two round loaves. The bread bakes to a deep, golden brown- a crispy crust and a tender interior. Unlike some other breads, you can slice into this one immediately and sample the goods. The bread itself isn’t all that sweet… the sweetness comes from the delicious addition of golden raisins and dried cherries. It’s a bread with a tender crumb. I don’t find it dry at all, and it’s especially good when it’s warm. This bread is amazing sliced up and toasted with a little butter and honey. Position a rack in the middle of the oven. Preheat oven to 400 degrees F. Line a baking sheet with parchment paper. 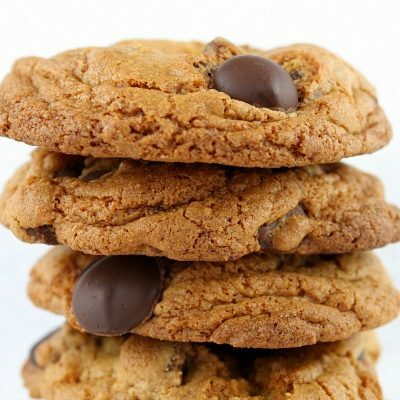 In the bowl of a food processor, combine flour, sugar, baking powder, baking soda and salt. Give it a couple of pulses, then add the butter pieces; pulse until butter is incorporated and small crumbs are formed. Pour flour/butter mixture into a large bowl and make a well in the center. Add buttermilk, egg, and egg yolk and stir just until moistened. 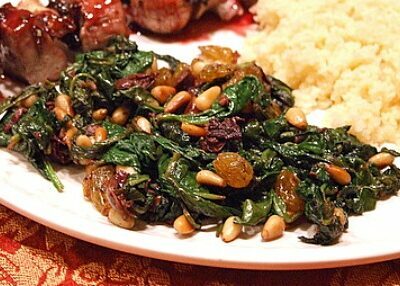 Then stir in the 3/4 cup raisins and 3/4 cup cherries. Turn the dough out onto a lightly floured surface and knead gently 5 to 10 times (dusting flour lightly onto dough if it’s too sticky). Knead just until the dough comes together and is smooth. 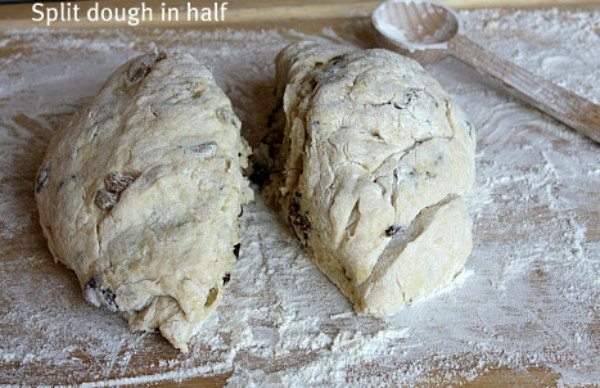 Divide dough in half and shape each half into a round. Stud a few extra raisins and cherries into the tops of the loaves. Dust the tops of the rounds lightly with a little flour. Transfer rounds to prepared baking sheet, leaving about three inches between them. Place another baking sheet of the same size underneath to prevent burning. 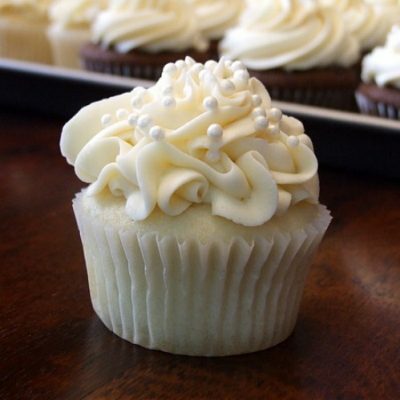 With a sharp knife, slash the tops with a large X about 1/2-inch deep. Bake until dark brown and crusty, 35 to 40 minutes, or until toothpick inserted into the center of the X comes out clean. The loaf will sound hollow when tapped on the side. Serve warm or at room temperature. 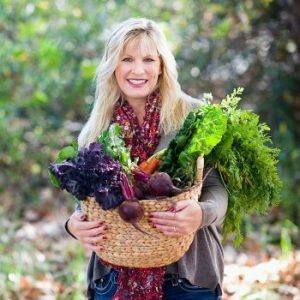 Store wrapped in plastic at room temperature or freeze in a zip bag for up to 2 months. Using low fat buttermilk is just fine. 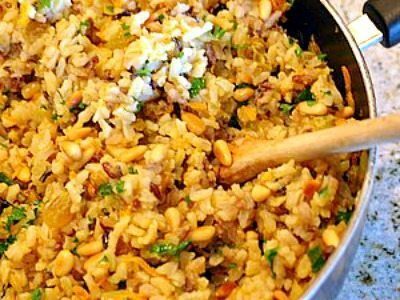 If you don't have a food processor, this recipe can be made by hand. 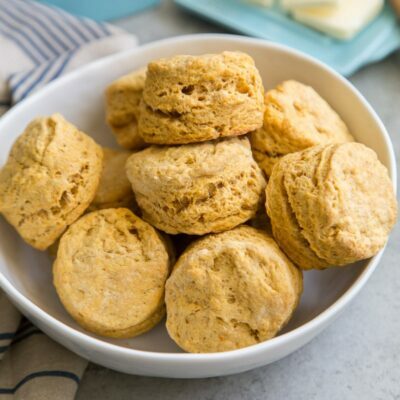 Use your fingers to rub the flour and butter together to create the crumbs. Check on your baking bread at about 25 minutes. If it appears to be browning too quickly, cover loosely with foil. 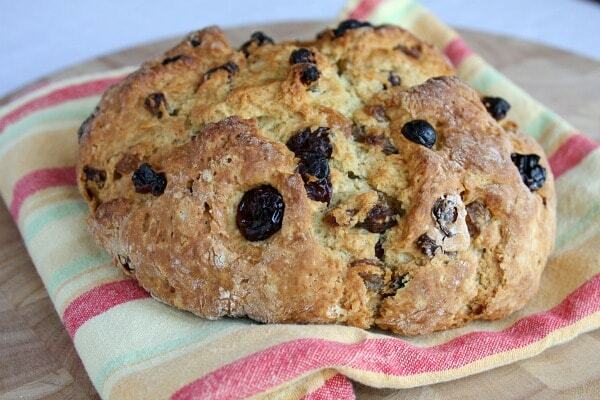 I love irish soda bread. It is a tradition of mine to make…. really good with stew or even for breakfast. Love the cherries in yours.